Leon was founded on the twin principles that food can both taste good and do you good. 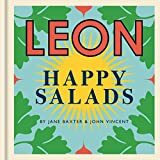 In this book, Leon authors Jane Baxter and John Vincent bring together 100 recipes for fresh, vibrant, delicious salads that will have you feeling healthy and happy. 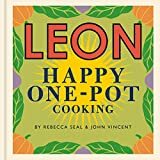 Leon, the home of naturally fast food, has created a collection of more than 100 fuss-free, full-of-flavour recipes for main course dishes that you can create with only one cooking pot, pan or baking tray. Five years after the traumatic events witnessed by Rita and Yansis in Manchester, the couple finally agree to return with their young son, Daniel, to attend her brother John's wedding to the beautiful Paula. To some, Fiona O'Dell is clever and manipulative. To others, she is a dangerous sociopath. One thing is certain - she's trouble wherever she goes. Now she has vanished from her job, but not before being seen leaving a motel room where one man is found dead, another on the edge of death. A plot twist you won't see coming. Book one of the Epic Sword and Sorcery Fantasy set in Middle East on the cusp of an invasion by the unbeatable Makedóne army from the west and the appearance of a new and far more dangerous barbarian far to the East. Sam Chesworth's future is perfectly mapped out – college, travel and convincing the girl of his dreams to date him. Everything is going according to plan. Until Evelyn Shaw crosses his path. She's a hybrid – half human, half hunter – and she's not from this world. Rachel Maguire finally has it all. Matriarch of the powerful Maguire family, whose name is feared and revered throughout the city of Manchester, she is wealthy, contented and more in love than ever with her husband Danny. Working in conjunction with their one time arch enemies, the Law Family, life for the Maguires has never been more peaceful. Neala and Darcy have loved to hate each other since they were kids. Forced together, will they be naughty—or can they play nice? There's one must-have toy this Christmas, and Neala Clarke has told her niece Charli she'll get it for her. Never mind that she's got less than a week and it looks like everywhere is sold out. She's promised Charli a Fire Princess doll—and Neala is a woman of her word. When Posie Parker's childhood friend is robbed of a priceless jewel and becomes a suspect in a cold-blooded murder case, budding detective Posie vows she will clear his name. Aided by her seriously gorgeous assistant Len, Posie soon realizes things are not quite as they seem, and the darkly-glamorous world of London's theatre and glittering nightclubs prove far more dangerous than she ever could have imagined. It's true what they say: one moment can change your life completely. I found a woman's body on the common. I touched her; that was all. But now the police won't leave me alone. Because all the evidence is leading to me. In the 60s London of gangsters, prejudice and terrifying gang wars, Barrister Charles Holborne spends his life dealing with the worst examples of violent criminality. After successfully winning a number of high profile cases, he is building a reputation among Soho's criminal classes as a man who gets the job done, a reputation that doesn't endear him to his establishment colleagues. Welcome to Midnight, Texas, a town with many boarded-up windows and few full-time inhabitants, located at the crossing of Witch Light Road and Davy Road. It's a pretty standard dried-up western town. Day by Day Armageddonis the handwritten journal of one man and his struggle for survival. Trapped in the midst of global disaster, he must make decisions that could mean life, or which could condemn him eternally to walk as one of them. Enter, if you dare, into his world. The world of the undead. It is the winter of 53/52BC and while Caesar struggles with the chaos of a failing republic and recruits troops in Aquileia, Gaul's freedom fighters emerge, with a desire for Roman blood. Kris's twin sister has just gotten a ventriloquist's dummy and its all anyone - their parents, their friends - seem to care about. Kris is tired of being ignore so she gets a dummy of her own. But double the dummies stare to mean double the trouble...and horror. Happily settled in Florida, Sonja believes she's finally escaped the trap set by unscrupulous drug lords. But when her son Tomas is taken, she's back to square one … and Iceland. Her lover, Agla, is awaiting sentencing for financial misconduct after the banking crash, and Sonja refuses to see her. And that's not all … Agla owes money to some extremely powerful men, and they'll stop at nothing to get it back. Accused of consorting with demons in her home town, Xandrie flees, only to find herself in a greater danger. She's a mere human woman, thrust in a brutal tournament pitting vicious dragons females against each other. Yet, she can't find it in herself to give up, as the winner will Claim the throne, and more importantly, the hand of the enticing Dragon King. My name is Sadie, and I'm a nymphomaniac. Vampires are extinct. The mortals won that war decades ago. But the legends of the blood thirsty creatures live on with the alluring hybrids they left behind. Fallon's village fears them. They lock them away to use and abuse them. Not that they treat mortals like herself much better. What would you do if you found yourself cast 22 years into the future? Into a world where your home is no longer your home and you've been declared legally dead? This is the situation that Daniel Fisher finds himself in at the beginning of this, the latest release in The Time Bubble series. Stranded in the future, in a place where his outdated currency is worthless, things go from bad to worse for Dan very quickly. Magic and romance weave together in this spellbinding fantasy set in ancient Persia. As a girl and her demon pursue a deadly foe across the arid waste of the Great Salt Plain to the glittering capital of Persepolae, she's forced to question his slavery—and her own loyalty to the empire. Book #1 of the Fourth Element trilogy. Ian Bridges has a job he excels at, works his own hours and earns good money, but he's not a happy man. He wants more from life and longs to find that special lady to share his success with. The problem is the only women he ever meets in his line of work usually end up dead. Still, Bridges is not to be put off and he's determined to find his Miss Right even if it means him having to kill every women in Britain. Detective Sergeant Catherine Bishop has an enigmatic new boss, DI Jonathan Knight. How he'll adapt to life in Lincolnshire after years in the Met is anyone's guess. When the body of a well known local thug is discovered, an intriguing message found on his battered corpse raises unwelcome questions. Is DS Bishop herself being accused of the grisly murder, or does the message point to a more sinister secret? Detective Inspector Geraldine Steel relocates to London to take on another thrilling murder investigation.